Judith LeBlanc joined the Communist Party USA in 1974, and is currently a vice chair for the organization. She chairs its Peace and Solidarity Commission, and has previously worked as a reporter for the CPUSA's newspaper, People's Weekly World. On March 30, 2002, LeBlanc endorsed a call by the CPUSA for a national holiday in honor of late Farm Workers Union leader Cesar Chavez. 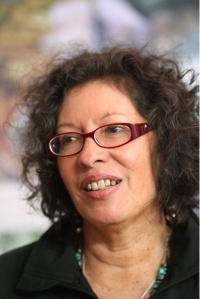 In July 2009 she spoke alongside Michael Eisenscher and Mort Frank at the 6th National Convention of the Committees of Correspondence for Democracy and Socialism. CCDS was formed in 1991 when approximately one third of the CPUSA membership split from the party. This page was last modified on 23 December 2010, at 01:45.